Home / Posts Tagged "buyers agent"
Many times in my career, I’ve worked with home buyers to help them find and buy a home. Occasionally, a buyer that I’ve spent many hours working with finds themselves browsing an open-house and somehow ends up signing a purchase contract with the open-house listing agent. While this is a great thing for that listing agent, it does not fully serve to benefit the buyer. Under all circumstances, I recommend that home-buyers work exclusively with a buyer’s agent, and stick with them. Its important to find a good agent to represent YOU. There are a number of important reasons why you should follow this practice, which I’ll go into detail here (with few to none of them intended to protect the potential earnings of that buyer’s agent). Many home buyers do not fully understand an important piece of the puzzle in the “for sale” listing contract for the home. In order to understand why it’s important to stick with your buyers’ agent, let me lay a little groundwork. When a home is listed for sale, the seller of the home signs a listing contract with the “listing agent”. 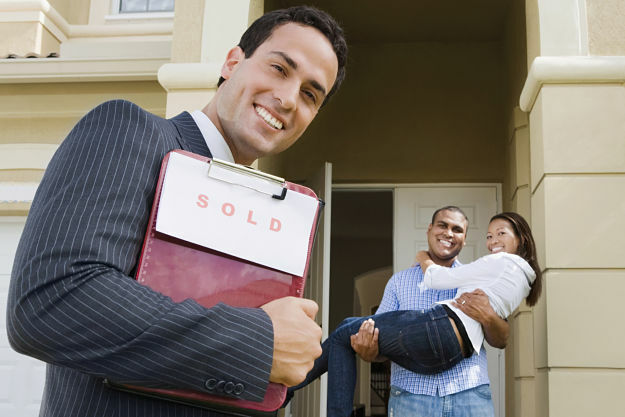 The listing agent or broker becomes the representative (agent) for the seller. In the listing contract, a very important provision to understand is that there is a commission amount, pre-designated for the listing agent AND for the yet-unknown buyer’s agent. So, for example… many homes are listed for sale with a 6% commission, where some homes are listed for less. This means that six percent of the sales price is set aside as commission for the REALTOR(s). Normally, the six percent commission is pre-arranged to be divided in half, with three percent being reserved for the seller’s agent and three percent being reserved for the buyer’s agent. Since nearly all homes listed for sale have a pre-arranged commission agreement set up for a buyer’s agent, this means to you, working with a buyer’s agent is essentially free. Buyers do not pay the buyer’s agent, the home seller does. So it doesn’t cost you anything to have your own personal buyer’s agent. The internet has changed the roll of the REALTOR. In the past, people found their agent first, THEN looked for a home. Today, the top real estate agents may be acquired when the buyer finds the home online, and speak with the listing agent. The importance of having your own buyer’s agent is very simple. The buyer’s agent represents you. They are charged with protecting your interests first. This is referred to in real estate and law as a “Fiduciary Responsibility”. Your REALTOR has to make sure that everything that happens in the sales transaction is to your advantage, as much as possible. The listing agent is also charged with protecting the seller’s interests, so when you come along and buy the home through the listing agent, by default, that listing agent MUST assume the duty of representing you, the buyer, too. How does this complicate things? The example I’ve given to my clients over the years is to assume you’re being sued in court. When you get to court and find yourself sitting there at the defendant’s table without your own lawyer, you are self-represented. You are allowed to represent yourself in court, but not in real estate. In real estate, if one party has representation, both parties must have representation. So, back to my courtroom example, instead of getting your own personal attorney, what if the attorney for the plaintiff offers to represent you too? Does that seem like a good idea? Why would anyone being sued in court allow the plaintiff’s attorney also represent them as a defendant? They probably would not. So why would you let the buyer’s agent represent you when it comes time to buy a home? Most home buyers don’t really understand all the duties and responsibilities that REALTORS have in a sales transaction. The seller’s agent is trying to get the best deal possible for the seller. If that REALTOR is working hard to get the best deal for the seller, how practical do you think it is that he or she will also work just as hard to make sure you get the best deal too? Seems contradictory, right? Well, it is. Buyers and sellers of real estate have different interests. They have different objectives and goals. They have issues that have to be negotiated to achieve common ground between both sides. Each side needs to have their own independent representation. The buyer’s REALTOR and the seller’s REALTOR are both trying to close the deal, but they have different clients’ needs to satisfy. To make a political reference, this is why you don’t have Democrats who are also Republicans (or vice versa) at the same time. It just doesn’t make sense. To be effective for their client, REALTORs need to be on one side of the fence or the other, not both at the same time. So, in conclusion, please be sure to remember these important points. The buyer’s agent is paid by the home seller, so there is no cost to you. If you buy a home directly through the listing agent, you’re not going to get a discount due to having only one REALTOR because the listing agent will be obligated to represent you too… and he/she will earn both sides of the pre-arranged commission (called “double-ending” in the trade). So, if there’s already a commission set aside for you to have your own equal, but separate, representation, my advice is to take it. For more information about buyer’s agency, consult your local trusted REALTOR .